The first day of school is quickly approaching and buses filled with excited students will soon be back on the roads. Parents are reminded that back-to-school readiness includes reviewing bus safety and etiquette. Riding the school bus has longtime been considered the safest form of student transportation. According to the National Highway Traffic Safety Administration, American students are nearly eight times safer riding in a school bus than with their own parents and guardians in cars. As with all forms of transportation, dangers do exist. According to HCDE’s Center for Safe and Secure Schools: The greatest danger is not riding on the bus, but rather getting on or off the bus. 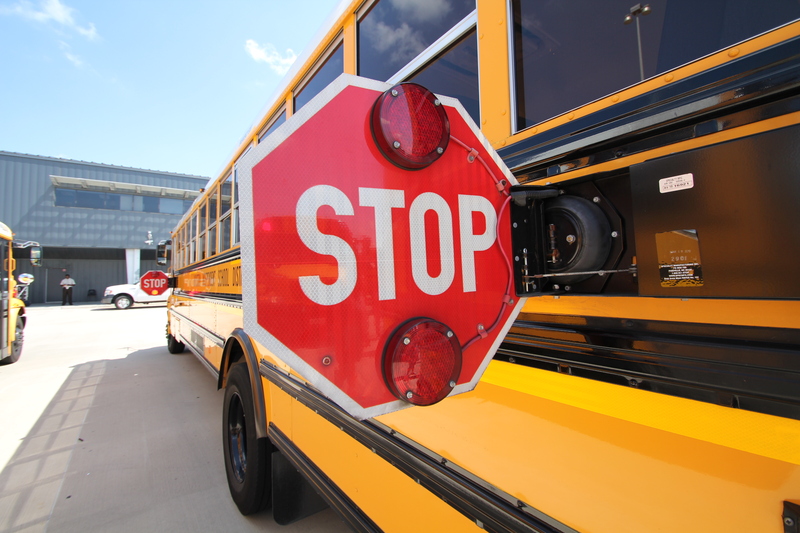 Young school children ages 5-7 are the most at risk for bus-related injury. • Talk to your kids about bus safety and respect. Ridership is a privilege. It can be taken away due to bad behavior, so check with your school district about established guidelines. Refer to the policy as “school bus behavior policy” and go over it with your child. • Dress appropriately for the weather. Many buses are not air-conditioned. • Be at the bus stop at least five minutes before the bus is set to arrive. Tardiness and other mishaps can lead to mistakes in safety measures. Examples might be running in front of the bus; running back to find something left on the bus; or bending over or bending down to retrieve something dropped while getting off the bus. • Kids should follow the five giant steps rule: Be five giant steps back from where the bus actually stops until it comes to a complete stop and the driver opens the door. • Backpacks/bags need to be fully closed and sized appropriately for the child to prevent safety hazards such as dragging straps. • Always stay seated on the bus. Teach your child to stay in the seat until the bus comes to a complete stop at your child’s destination. • Show appreciation to the bus driver. Remind your kids to say thank you when they get off. Kindness and good manners go a long way. • Railroad crossings require drivers to stop, to open the door and to make sure the coast is clear. Teach your kids to be extra quiet during these times. • Go over your child’s bus routine. Describe the location and street where your child should get off. • Don’t hang out of the window. Keep body parts inside the bus. • For younger kids, write down their names, bus number, bus stop and where you may be reached and put that information inside their backpack. Help your children memorize your cell number; putting it to song can help. • Bullying should never be tolerated. Talk to your child about bullying on the bus. Read your district’s school bus behavior policy to understand to whom you should report such behavior. It may be the driver, teacher, principal or someone else. Each school district has school bus ridership rules and policies in place. Families are encouraged to navigate their school district’s website to locate and discuss the school bus rules with their children.